Fandom In Stitches: That's Sir Nicholas to you! That's Sir Nicholas to you! 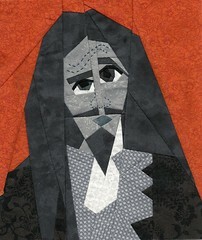 Paper plus fabric and thread are a magical combination in Michelle Thompson's portrait blocks! See a slew of them on our Harry Potter page, along with other great Character patterns by a variety of FiS designers! As always, Fandom In Stitches patterns are absolutely, 100% free, no-strings-attached, but if you want to drop a photo of your quilt or quilt-in-progress in our Flickr Group, we definitely won't say no to that! ha! thats hilarious!! and adorable! Michelle is super talented, there's no doubt about that!